Good Question: What are the Differences between a For-Profit and Nonprofit Senior Living Community? - Grace Ridge Retirement Community - Morganton, N.C.
Good Question: What are the Differences between a For-Profit and Nonprofit Senior Living Community? If you are considering a move to senior living, understanding the differences between for-profit and nonprofit communities can help you choose the best fit for your needs. Ownership and mission stand as two prominent differentiators between the two types of communities. Grace Ridge is a nonprofit community that frequently receives accolades and awards for its exceptional staff members, campus and programming, along with its dedication to enhancing the lives of older adults. Grace Ridge is owned and managed by Carolinas HealthCare System Blue Ridge. One way the community demonstrates its commitment to older adults is through membership in LeadingAge North Carolina, a state chapter of a national organization dedicated to inspiring and serving seniors. 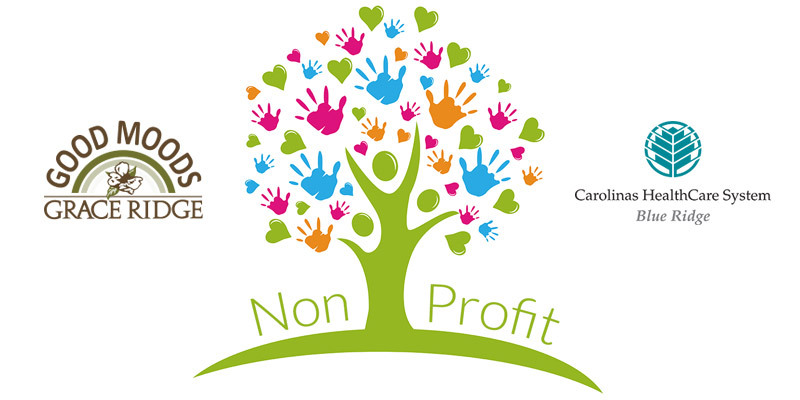 What are some other characteristics that set nonprofit communities apart? With significant experience in nursing and administration, Grace Ridge Executive Director Brenda Yost has shared her expertise with other communities as a surveyor for the Commission on Accreditation of Rehabilitation Facilities. She notes a number of additional differences between for-profit and nonprofit communities. In the area of dining, some for-profit communities say they offer three chef-prepared meals daily, while the reality is that the same meal is prepared and served to everyone. Unlike in nonprofit communities, for-profits often do not provide a varied menu and are unable to accommodate special diets, including gluten-free, diabetic and pureed. Some for-profits also will promise that caring, on-site managers are available around the clock, while in reality the managers often are a couple who lives in the community. Many for-profits also do not have specialized team members available, such as the social workers and independent living nurses available at Grace Ridge. In addition, “scheduled local transportation” may mean a strictly regimented calendar of transportation that’s offered only a few days a week, unlike the readily available drivers at Grace Ridge who take last-minute calls and grocery shop for residents. Planned activities, outings and special events touted by some for-profits in reality often are planned by in-house, resident managers who arrange for church groups and others to visit occasionally. Grace Ridge’s Life Enrichment team offers a full calendar of programs that engages residents rather than simply entertains them as spectators. Weekly housekeeping and linen services often mean a for-profit community provides bed linens and bath towels, but may not provide the service of changing beds. Weekly cleaning also is typically limited in a for-profit community. Yost points out a variety of added amenities are available in a nonprofit like Grace Ridge, including in-house exercise programs for all ability levels, massage therapy, numerous outside excursions and menus with many different choices. She added that there is much more personalization offered for specific dietary provisions, and having a dedicated social worker and independent living nurse is rare in a for-profit independent living community. “When I review the added amenities of our community, the advantages of a nonprofit over a for-profit are apparent,” she said, adding that Grace Ridge continues to increase its services to residents. Another characteristic that sets Grace Ridge apart as a nonprofit is its recent transition to a Life Plan Community. To fully represent the vast array of services and amenities available, Grace Ridge has retired the Continuing Care Retirement Community designation to more fully represent the dedication to active, vibrant living. From wellness and fitness to exceptional health care, personalized dining, stimulating outings and more, Grace Ridge residents benefit from the community’s status as a nonprofit, Life Plan Community.